Even in a world which sees new app releases every day, WhatsApp retains its top spot when it comes to messaging services. And, moreover, it surely is one of the foremost contenders for the most used app of all time. People love WhatsApp for its reliability and simplicity. You open the app, tap on the contact, write the message and press send. That’s it, you are done. What better way to start the list than the newest feature addition to WhatsApp app. Sadly, right now it’s for iPhone users only. Now, whenever you are sending a photo using WhatsApp you will see a small text saying, “Swipe up for filters”. Upon swiping up, you will find a set of filters you can apply to your photos, just like on Instagram. At the time of writing this article, there are only 6 filters available but are expected to increase with future updates. 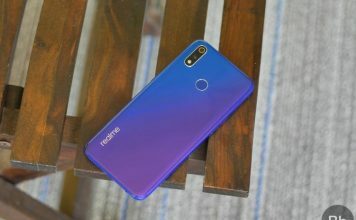 Also, now when you send four or more photos at once, the photos will be send inside an album and hence, will not hijack your chats like before. Suppose you need to send someone a message and are not in a mood to type or maybe you are in a situation where typing isn’t an option, what will you do? Worry not my friend, WhatsApp has got you covered here. You can send messages on WhatsApp using the voice assistant on your phone and it supports both Google Assistant and Siri. 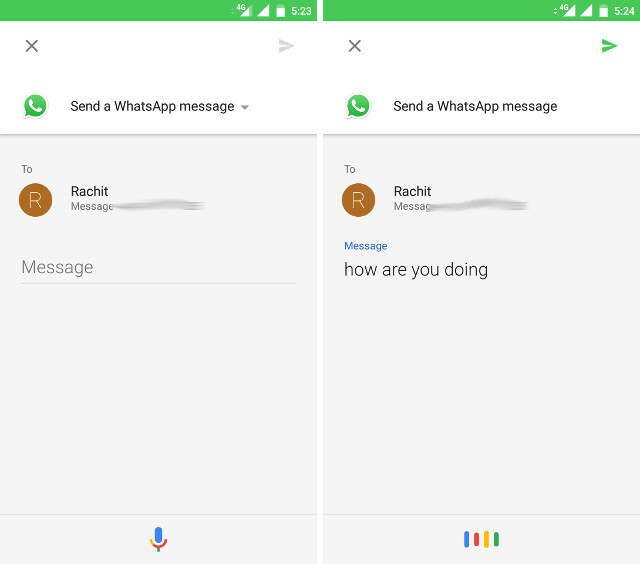 To do that, Android users can call out “Ok Google” to launch the assistant and say the following phrase, “Send a message to <Contact Name> on WhatsApp”. It will then ask you to dictate the message. After you have dictated the message, the assistant will ask you to confirm sending the message. Just say, “Yes” or “Send it” to send the message. 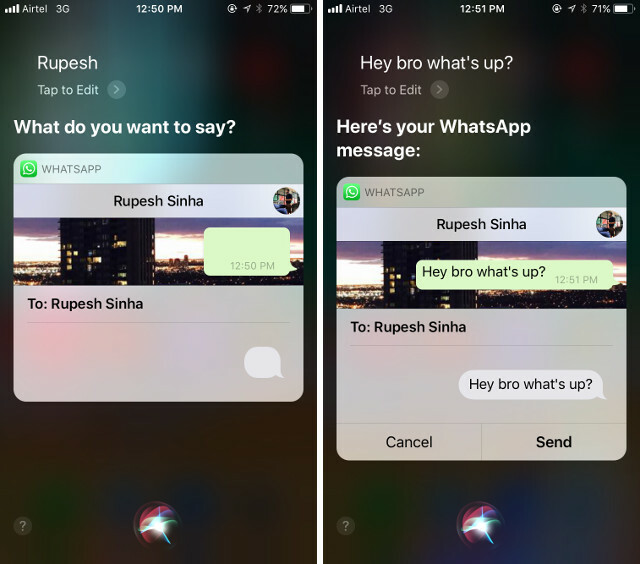 The procedure is same for the iOS users with the only difference of calling on Siri (“Hey Siri”) rather than Google Assistant. Since most of our conversations happen over WhatsApp, it is imperative to protect our data. There are a lot of tips and tricks which we have already covered that help you do just that. However, this is a new one and a needed addition to our security tips. One way someone could steal your chat records and even keep an eye on your future conversations is by just logging into your account on a different device. Anyone who has access to your device even for a few seconds could easily do that. Enabling Two-Step Verification will stop that from happening. When you enable Two-Step Verification, whenever someone tries to login with your account on any other device, other than providing the OTP, they will also have to enter a six-digit code set up by you, thus preventing them from getting access to your account. 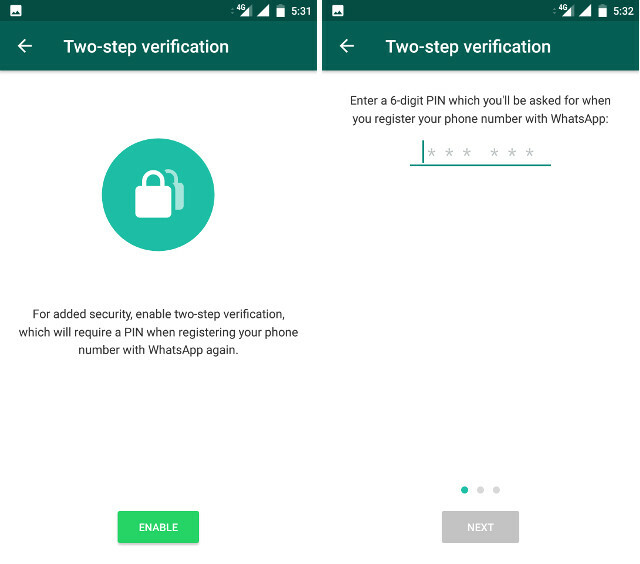 To enable it, head over to WhatsApp Settings>Account>Two-step Verification. Tap on Enable and then it will ask for a six digit code. Re-enter the code to verify it and enter your email address as a backup. That’s it, you are done and more secure than ever before. For more details on WhatsApp’s two-step verification, you can check out our detailed article on the same. Securing your WhatsApp account is one thing, hiding your messages from prying eyes is another. By default, whenever you receive a notification, you can see a preview of the message on the lock screen and while that is handy, anyone using your phone can see the previews of your personal messages. 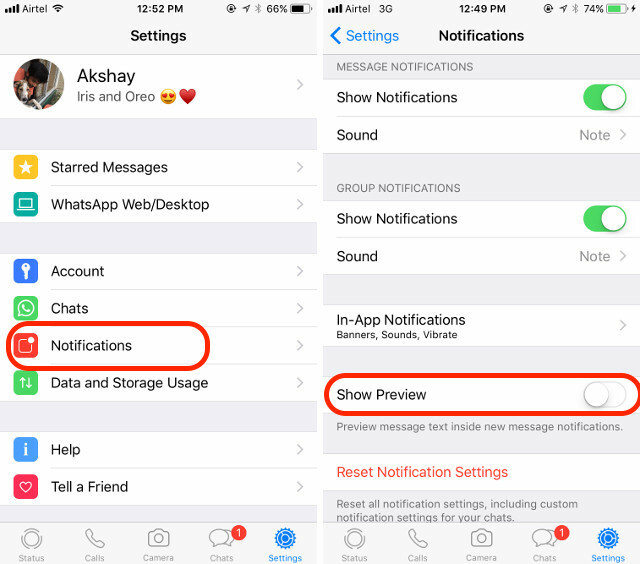 To stop the preview feature on the iPhone, go to WhatsApp Settings>Notifications>Show Preview and disable it. 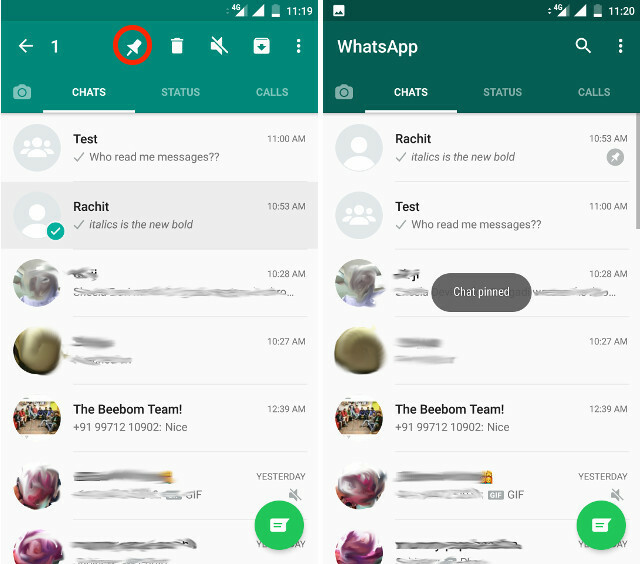 The procedure is a little bit different on Android, as there is no inbuilt WhatsApp setting to disable it. 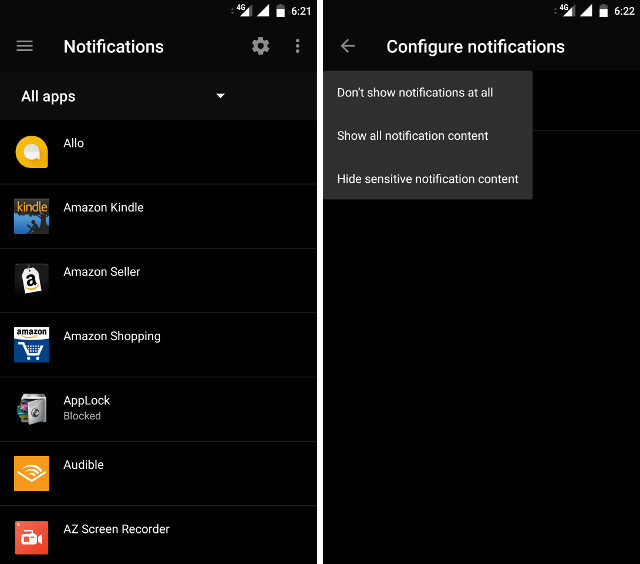 On Android you have to got to Android Settings>Notifications>Notification Settings and select “Hide sensitive notification content”. However, you need to keep in mind that this will disable preview for all the messaging apps and other important apps. Suppose you get a voice message from someone but you don’t have a headphone with you, what will you do? Of course, you cannot listen to it on a speaker as people around you will also be listening in on your private message. Do not worry there’s a hack for solving this problem. You just have to play the voice message and place your phone right on your ear, as if you are taking a call. 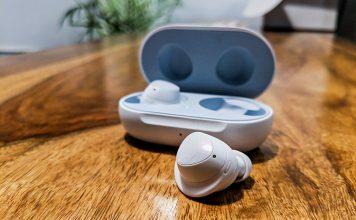 The proximity sensor will activate and instead of playing the message through speakers, it will play the message on your earpiece, so that only you can hear it. Status on your WhatsApp is a great way to let multiple people know about something at the same time without you having to send messages to them. With the inclusion of the new photos & videos status, more and more people are sharing their photos and thoughts using it. But, what if, you don’t want everyone to see your status. What if you just want a select group of people to see your status. You can do that by managing the settings in the Status option. 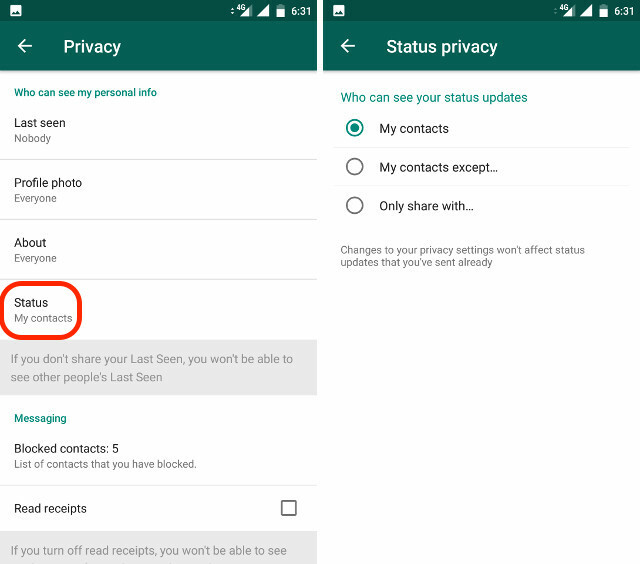 Just go to WhatsApp Settings>Account>Privacy>Status. Here you will three options, you can either share your status will all your contacts, or you can add specific contacts with whom you want to share your status with. You can also disbar specific contacts from seeing your status while everyone else on your contact list can see them. One drawback of using WhatsApp is that everyone you know is also using WhatsApp. Although this is a good feature, it can also result in a lot of spam messages. You might also want to use different WhatsApp account for personal and work purposes. 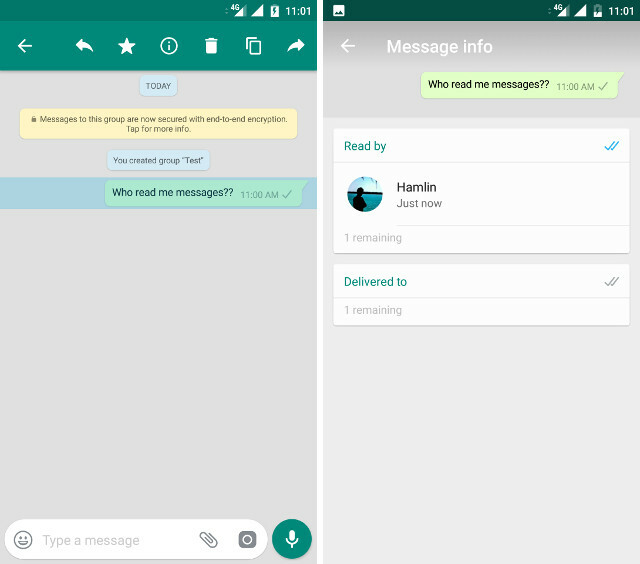 While WhatsApp doesn’t allow you to connect two different accounts on a single device natively, you can use third-party apps to achieve that on Android. 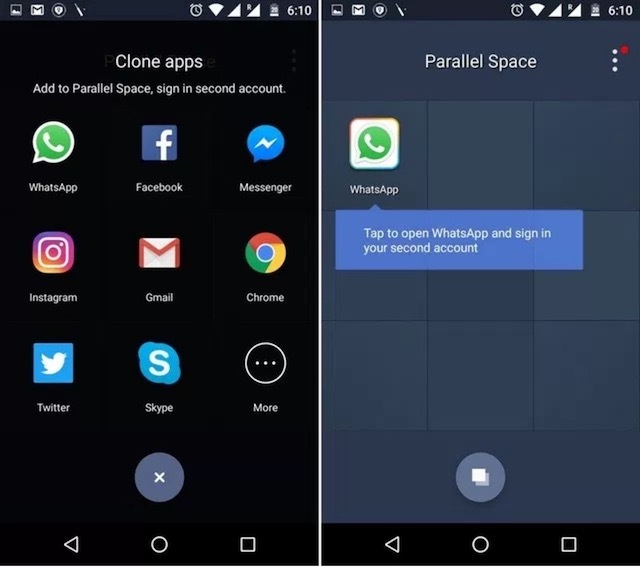 You can do that by installing an app called Parallel Space which allows you to run two different instances of WhatsApp on your device. The app not only lets you use multiple WhatsApp accounts, it even brings you separate notifications for both the accounts. You can check out our article on the app ton get more details. You can also use multiple WhatsApp accounts on your PC with the All-in-one Messenger Chrome app. The app also supports other messaging platforms such as Messenger, Hangouts, and Skype. Check out our detailed article on the Chrome app to know more. 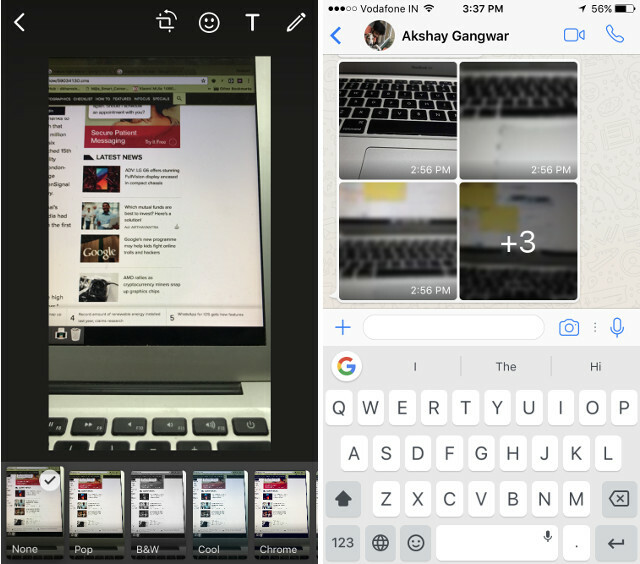 WhatsApp recently introduced sharing of different types of documents, like PDF, DOCX, PPTX etc. Along with documents, you can even share GIFs and your current location using WhatsApp. To share your location or document, just tap on the attachment icon and select your pick. From here you can also directly share GIFs which are already stored on your phone. You can even create a GIF inside WhatsApp itself. 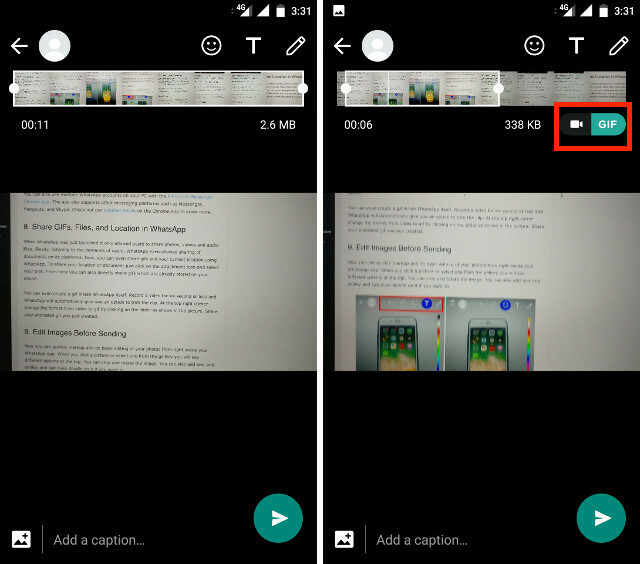 Record a video of six seconds or less and WhatsApp will automatically give you an option to trim the clip. At the top right corner, change the format from video to GIF by tapping on the slider as shown in the picture. Keep in mind that you will only get the option to create gif when your video is lesser than 6 seconds long. 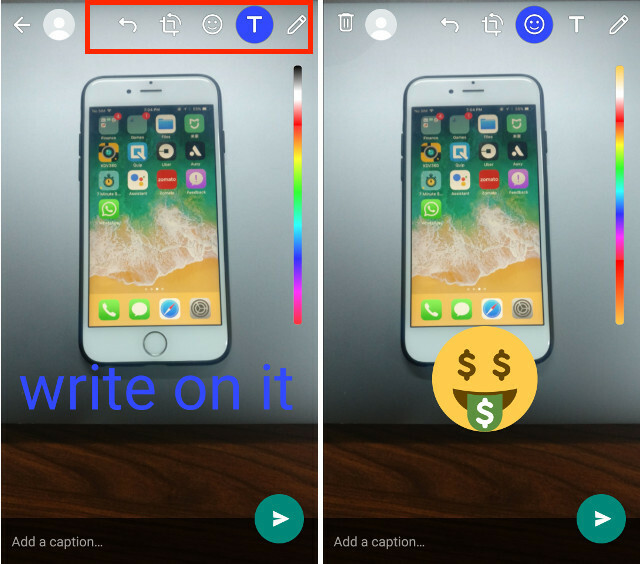 Now you can quickly markup and do basic editing of your photos from right inside WhatsApp. When you click a picture or select one from the gallery, you will see different options at the top. You can crop and rotate the image. You can also add text, emojis and can even doodle on it if you want to. Now you can format your text while sending messages on WhatsApp. You can either change the font or you can change the format of the text to make it bold or italics or strike-through any text. 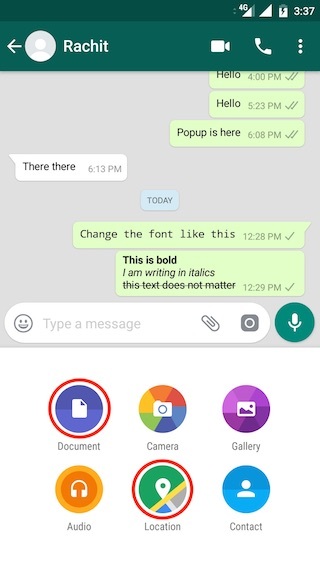 WhatsApp uses a very simple markup language technique to achieve that. 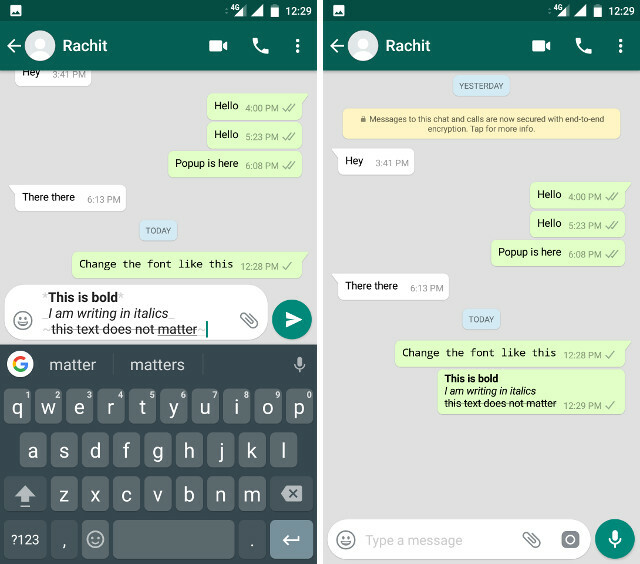 The new font introduced by WhatsApp is called FixedSys. To format your text in FixedSys, you just have to use grave accent (`) character 3 times before and after your text. 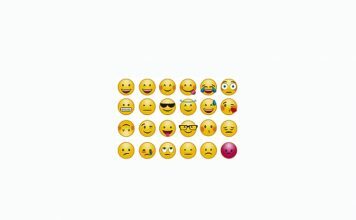 The character can be accessed by iPhone users on their phones by long pressing on the apostrophe, while the Android keyboard features it on the second page of symbols. On Windows and macOS, you will find the character just below the Esc key. To make your text bold, just add a star (*) and for italics add an underscore(_) at the start and end of the line or word. For example, writing *bold* will make it bold and _italics_ will make it italics. You can also add ~ at the start and the end to create strike-through for a text. See the pictures for more clarity. When you are chatting in a group, the blue ticks are of no use because unless and until everyone on the group has read the message, it will not come up. Not only that, most of the time, you will only see one tick on your messages, as some of users in the group might be offline. If you want to know who in the group has received and read your messages just long press on your message and tap the (i) icon at the top on Android or the info option in the iPhones. If you need to keep a chat on the top, so that is not lost beneath a sea of chats and can be accessed easily, I don’t blame you. We receive messages from so many people on a daily basis that sometimes we lose track of what is important. With WhatsApp’s chat pinning feature, you can pin specific chats at the top. However, this feature is only available for Android users. To do that, long press on a chat and tap the pin icon. You can pin multiple chats at once. 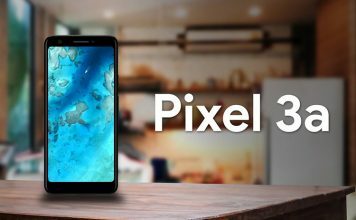 With this feature, you will never lose track of what’s important. 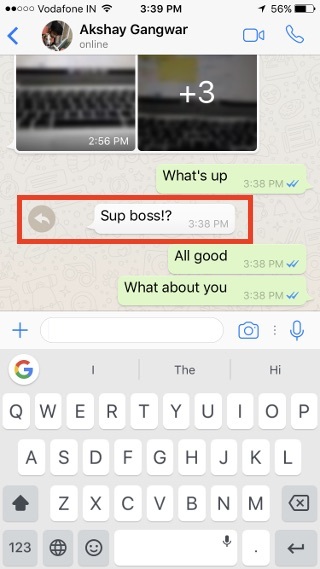 WhatsApp recently introduced a nifty feature using which you could quote a message you were replying to. The feature comes handy, especially inside the group chats. The way we do it is by long pressing on a message and tapping on the reply icon in Android and reply option on the iPhone. However, there’s a quicker way to do it on iPhones. You just have to swipe on a message from left to right and it will automatically open the reply field. How cool is that? 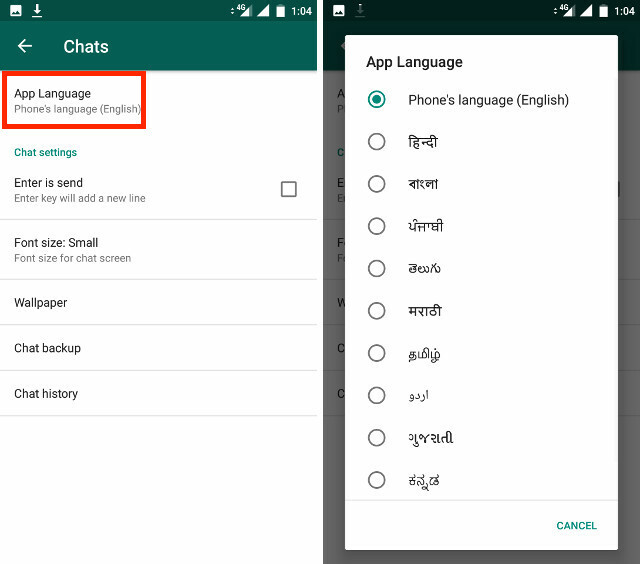 One neat feature of WhatsApp is that it also allows you to change the default language for your chats from right inside the app. To do that, just go to Settings>Chats>App Language and select the language that you want to. Just, keep in mind that the language options are tied to your specific region. We share a lot of photos, including memes and other funny pictures using WhatsApp. It is easier to share photos on WhatsApp if you want to share it privately or a selected group of people. However, slowly the shared photos eat away a chunk of space on our phones. It is a pain to browse through your WhatsApp media history and individually delete the unnecessary photos. This is where Siftr Magic Cleaner comes to our help. 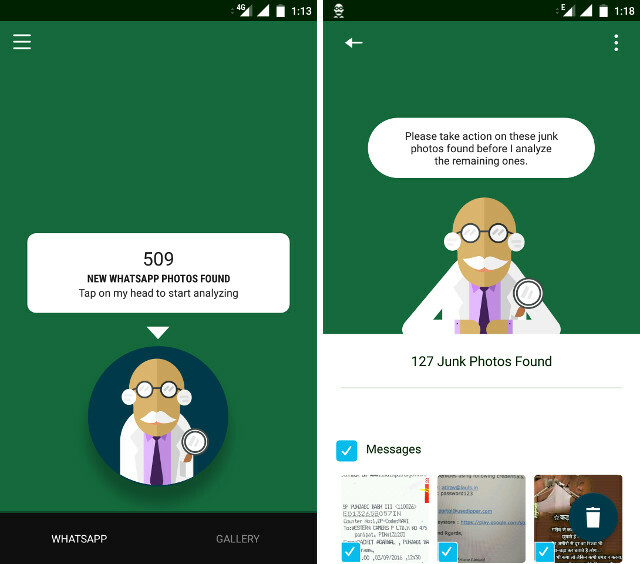 It scans your WhatsApp media library and intelligently categorises the photos based on their importance. It also recognizes duplicate photos and helps you delete them in a batch. The app interface is pretty simple. When you launch the app, it has a single button tapping which will start scanning of your WhatsApp library. After it has identified junk photos you can delete them in a batch. This app is a must have for users who share a lot of photos and GIFs on WhatsApp. 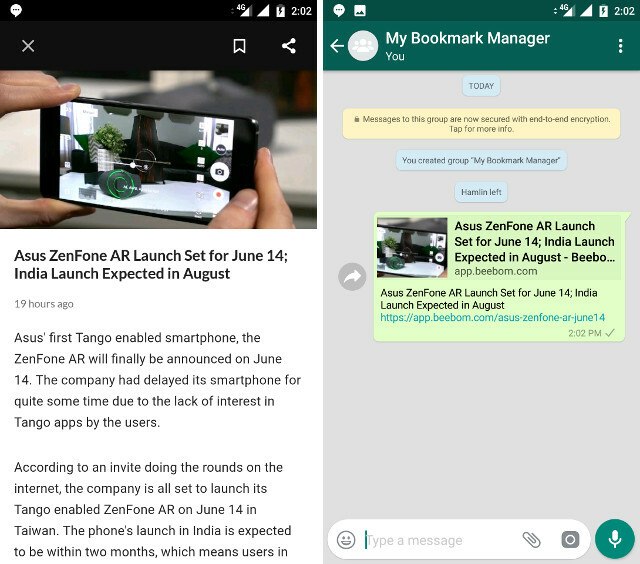 What if I told you that you can use WhatsApp as a personal repository for all your bookmarks and links. It is a very handy trick as all your links will be available to you at your fingertips and you can easily share them with your friends if you want to. To do it, open WhatsApp and create a group with a single friend. Now remove that friend from the group, this essentially means you will be the lone member of that group. Now whatever links you will share in that group will be for your eyes only. Whenever you are reading an article, just share the article on WhatsApp and select your group. One pro tip is to pin the group on top so that it is always easier to access. You can even small notes and reminder for yourself. Pretty cool, right? Find These WhatsApp Tricks Interesting? We have covered a lot of tips and tricks for WhatsApp in our previous articles, you can read about them here and here. Also, watch our video covering some of the best tricks and tips for WhatsApp. By learning and using these tricks, you can enjoy WhatsApp and utilize it to its full potential. Do you like these tips? 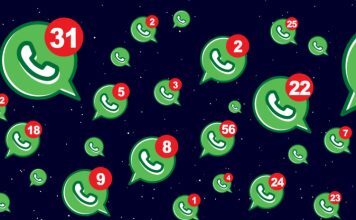 Let us know in the comments what are your favourite tips and tricks for WhatsApp.